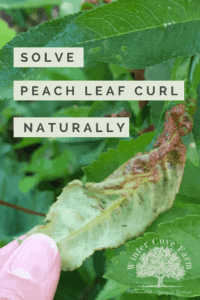 How to Stop Peach Leaf Curl In Its Tracks…..Without Using Poisons! 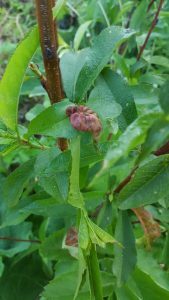 Peach leaf curl is a persistent fungal disease caused by Taphrina deformans and affects blossoms, fruit, leaves, and shoots of peaches as well as nectarines, apricots, and almonds. The foliage becomes distorted and reddened and is easily seen on trees during the spring. 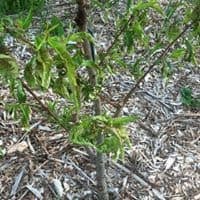 If not treated, the affected areas turn yellow and progress to a white/gray as the spores areThis fungus is one of the most common issues that affect peach trees for the backyard orchard and can reduce fruit production if not handled. If you do not handle this fungal issue, your tree can suffer irreparable damage. After suffering through years without treatment, it may actually die. contribute to the spread of Taphrina deformans. Humidity for more than 12 hours when the temperature drops below 61 F is all that is needed to incubate the spores. For the northern half of the US, this is pretty normal spring weather! A big reason that northern orchards seem to struggle with growing peaches. Leaf curl will stop in its tracks when the leaves stop growing or the weather is consistently dry and warm (79 to 85 F), by then the damage is done and your tree is seriously affected.On a recent Memorial Day weekend here in Maine, our weather ran between 50 and 65 all weekend with high humidity and partial cloudiness for more than 50% of the time. Can you say perfect leaf curl conditions?! The most common method of treating leaf curl is to spray sulfur or copper after leaf drop in the fall and again in the spring. Conventional thought is that once the leaves are infected, there is nothing you can do to fix it during the season. You need to wait until fall as spraying the tree with these products would burn the leaves that remain. Well, that’s not really what we’re looking for! I didn’t want to watch the tree suffer all season long. Icky fungal spores slowly killing our peach trees was not acceptable. I searched and tried many products with varying measures of success. After many trials, I have found that there is a fully organic and natural solution! 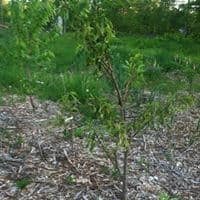 You can spray and treat Peach Leaf Curl during the season, healing your tree without strong chemicals or waiting for leaf drop. Not only will this knock back the leaf curl, but the leaves will heal. They will be a bit mangled looking from the infection, but they will photosynthesize which is their purpose in life! Here is a before and after photo of the same tree. This is a Reliance Peach on seedling rootstock. This only took 2 applications to stop the spread and heal the damage. A concentrated garlic extract like the one we use, Garlic Barrier 2002 AG+ Liquid Spray, 1 Gallon , will do the trick. It’s all natural and listed by OMRI as suitable for organic farm use. 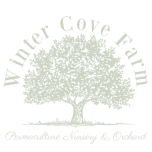 It has a multitude of farm, home, garden, and lawn care use and completely safe around people, pets, animals, and fish. I recommend the gallon as it is concentrated and will last for years as long as you don’t leave it outside where it will get super hot and/or freeze. Alright, you have leaf curl on your trees and you have Garlic Concentrate, you’re now all set to treat. Mix 1/4 cup of concentrate with 1 Gallon of water in a sprayer like this one Smith Performance Sprayers R200 2-Gallon Compression Sprayer for Pros Applying Weed Killers, Insecticides, and Fertilizers . Once you’re ready to go, early in the morning or when the sun is setting, spray the whole tree – leaves (top and bottom), branches, and trunk. Spray the ground around it for at least a 3-foot diameter. Do this every week until you see the leaves heal. The time for this may be extended depending on your weather. Some years it only takes us one spraying and other years it takes a good month to gain the upper hand on this. You will need to play a bit of this by ear. You can’t really overspray, though, so don’t worry about that with Garlic Barrier. It also helps us control ticks, black flies (Maine’s state bird), mosquitos, deer pressure and voles. I swear it has a magic wand, it does so much for us! It also helps with other fungal and bacterial problems in the orchard and garden. We’d love to know your experiences with Peach Leaf Curl and Garlic Barrier! Please share them here or on our Facebook Group, Permaculture Orcharding. Please note, some of these links are affiliate links, which means that if you click on one of the product links, we may receive a small commission. This allows us to concentrate on growing trees and not manage a retail store while being able to recommend only products that we use and love. Thank you for your support!